War, disguises, espionage...Middle grade readers will eat up this exciting picture book biography. 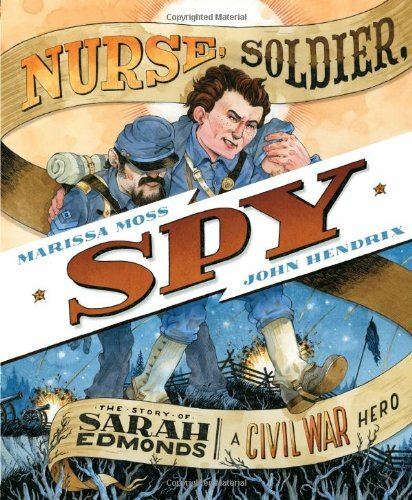 In Nurse, Soldier, Spy: The Story of Sarah Edmonds, Marissa Moss details how courageous, nineteen year-old Sarah served as a spy for the North during the Civil War. Sarah originally disguised herself as a man to escape an arranged marriage, and she quickly found that life as a man brought freedom and independence. Sarah wanted to help her country, so signed up to fight with the North during the Civil War. Once enlisted, Sarah proved to be better at shooting and riding than most men her age. She also took on the difficult roles of battlefield nurse and surgeon. When asked by a Union chaplain to spy on the Southern troops, Sarah disguised herself as freed slave and cunningly infiltrated enemy lines to gather information to bring back to her troops. "Freedom, she knew, wasn't something to take for granted. It was something to fight for, to cherish. And so long as her heart was beating strong, that's just what she would do." Pen & ink and acrylic illustrations capture the intensity of the Civil War and the danger involved with Sarah's work as a spy. The illustrations are truly unique. Hendrix uses monochromatic blue and orange illustrations on some pages to direct readers’ attention to the background or foreground. In one double-page spread, blue tones capture the gravity of war as Sarah nurses a wounded soldier in an army tent in the foreground. In the background, orange and green contrasting colors are used to illustrate a soldier with one leg as he watches houses burning on the horizon. Typefaces from broadside posters are used to highlight important quotes like, "I'm Your Man!" An author's note in the back of the book includes more details about Sarah Edmonds' contributions to American history. Moss points out that hundreds of women on both sides posed as men during the Civil War, yet Edmonds is the only woman to be recognized as a veteran of the American Civil War. 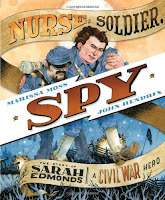 Nurse, Soldier, Spy would make an exciting read aloud for an upper elementary or middle school classroom. It’s also a book that boys and girls will enjoy reading independently and may serve as a springboard to other books about the Civil War. Isn't this a fascinating story? Thanks for the link, too. It's great to have another recommendation for a nonfiction read aloud. Thanks for taking part in today's Nonfiction Monday event. I am becoming a huge fan of you blog! Nonfiction is a huge struggle of mine. Looking forward to getting lots of great titles from here. Thanks for the kind review, glad you enjoyed our book! Thanks for hosting Nonfiction Monday, Tammy! Thanks for the kind words about our blog, Colby. We have many more reviews to come! Thanks for your comments, John. Your illustrations were amazing!